Hey Coffeeholics! Last weekend I was given the privilege of attending an Bloggers' Convention "SUNTERVENTION" by SNOE. I will be posting about the event in a bit but right now I just want to share to you what I wore. I love wearing black! And when I found this top, I fell in love with it immediately. Remember how I mentioned before that it was pretty rare for me to borrow clothes from my sister? Well I raided her closet the other day and I saw this black top that she never wore. Since its black, well it is now residing happily in my closet. Haha. Thanks sis! 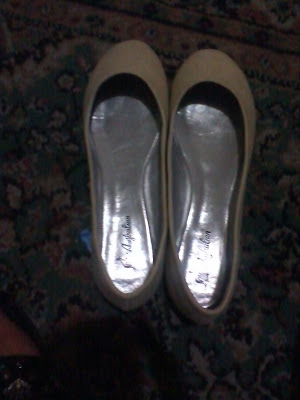 Also I just acquired this new pair of beige flats from Ausrtralian! I got this pair on a huge discount at Landmark. It used to be Php600+ but I bought it for Php 209. So if you wanna get a cute pair of flats, check out Australian shoes which are on 70% sale right now at Landmark, Trinoma! I just really love getting my hands on quality items at an awesome deal! Anyway, I really had a blast during the SNOE event and I'm so excited to share to you some of the products that I got thanks to SNOE. I'm now using it everyday and what with the freaky weather right now, it has been my hero since I've been using it. More on that on the next post. Anyway, hope you are all having a great week. How was yours my dear coffeeholics? Any recognition or awarding ceremonies you've attended recently? Well I will be attending one this Saturday and I will be the MC! So yeah, I will be showing off some of the outfits I've worn throughout the years I've been the Master of Ceremonies during our school's Recognition day.